Is This How Marvel's Doctor Strange Movie Will Begin? Where there’s smoke, there’s fire. And where there’s an incessant stream of Doctor Strange rumors, there’s basically confirmation that a Doctor Strange movie is arriving in theaters sooner rather than later. Latino-Review has been breaking Strange news on a regular basis lately. Their latest is a detailed plot description of a possible standalone Strange flick that could hit theaters as early as 2016. Watch the video above, and we’ll analyze it below. This video blog is part one of a multi-series “scoop” that Review says will lead us right into Comic-Con, where Marvel expects to hold court over Hall H on Saturday, bringing tons of Phase Three news. 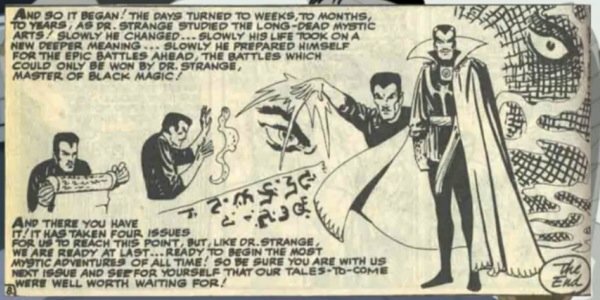 From what we learn here, Strange will be an origin story that begins with Stephen Vincent Strange, at age 10, losing his 13-year-old sister, Donna, in a swimming accident. The movie expects to flash-forward to a grown Strange earning his keep as a neurosurgeon. LR uses panels from classic Strange comics to visualize the screenplay by Thomas Dean Donnelly and Joshua Oppenheimer, who were hired back in 2010 to draft this script. This is a detailed, though formulaic, breakdown of a Strange origin … so far covering what’s likely the opening act of the standalone Strange movie. There are very few surprises to be found in the video clip – nothing quite as Earth-shattering as the news that Straneg might face such mystical villains as Dormammu, Karl Mordo and the Giant Mindless Ones. But it gels with what we have seen from Marvel when it comes to these standalone origin tales, and I would guess that you could do a similar one for Edgar Wright’s Ant-Man, which we also know is arriving in theaters in 2015, after The Avengers 2. So Marvel’s Phase Three, from what we can tell, will be developing new heroes in Ant-Man and Strange. What we don’t know yet for certain – and expect to learn at Comic-Con next month – is who will play Ant-Man and Doctor Strange in these movies. Also, who will direct Doctor Strange. The filmmakers for Marvel’s Phase Two are locked and loaded, with most of the through production or wrapping things up. The studio, if it wants to stay on track, needs to start hiring key personnel. Likely, they have already, and they’ll plan to announce at San Diego Comic-Con … or wake up one morning to find the news blasted across an eager Web site looking to break a major story.